Tesco has removed a sign which referred to a superhero alarm clock as a "gift for a boy" from its stores after a complaint from a seven-year-old girl. Karen Cole posted a photo of her "superhero-loving" daughter Maggie on Twitter next to the sign at the Tower Park branch in Poole, Dorset. It has since been retweeted more than 10,000 times. 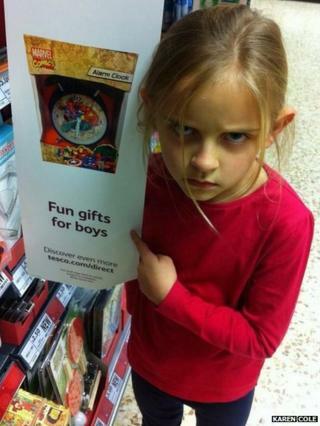 Tesco apologised and said the sign had been removed, adding it would "make a great gift for both girls and boys". Mrs Cole, from Shaftesbury, tweeted: "My superhero loving 7yo daughter not impressed when she spotted this sign in @Tesco today @LetToysBeToys"
The mother of three said Maggie had always been interested in superheroes, dragons and knights. Last year, she said she explained to her "all toys were for all people" after she had concerns that some were only for boys, and others only for girls. "When she saw the sign I think she was cross because it was saying the opposite of what I had told her," Mrs Cole said. She said she had been "amazed" by the response on social media and was "very pleased" the signs had been taken down. A Tesco spokesman said: "The sign has been removed and we're sorry if it caused any confusion." Campaign group Let Toys Be Toys is asking toy and publishing industries to stop limiting children's interests by promoting some toys and books as only suitable for girls, and others only for boys. A spokeswoman said the group was pleased the photo of Maggie had resulted in the removal of the sign. "Signs like these do influence people in their choice of what toys to buy children," she said. She added they "make children feel 'wrong' for liking certain things".